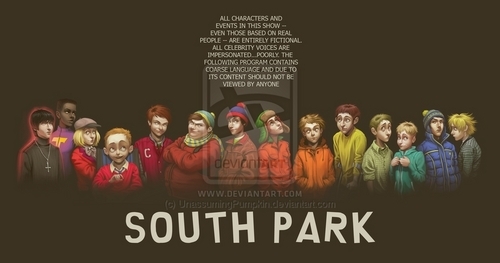 Goin' Down to South Park. From left to right: Damien, Token, Pip, Timmy, Clyde, Cartman, Stan, Kyle, Kenny, Jimmy, Thomas (the Tourette's kid), Butters, Craig and Tweek.. HD Wallpaper and background images in the साउत पार्क club tagged: south park southpark stan cartman butters kyle kenny damien tweek. This साउत पार्क fan art might contain हस्ताक्षर, पोस्टर, पाठ, चॉकबोर्ड, साइन, and साइन इन करें.